Add a finishing touch to your nursery with a crib skirt or dust ruffle created by Sweet Jojo Designs. Decorate with this stylish mix and match piece or coordinate with an existing Sweet Jojo Designs ensemble. 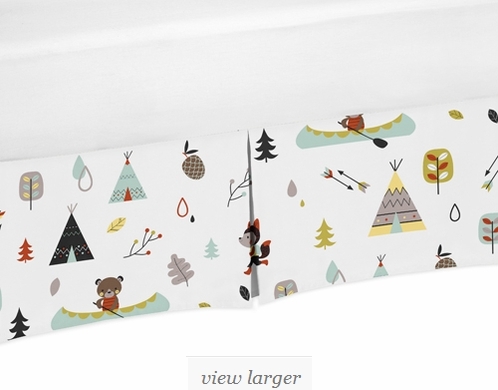 They can be paired with our large selection of crib sheets, crib bumpers, and other room accessories to complete the look of your child's room. Woodland Wall Hanging Tapestry Art Decor for Outdoor Adventure Collection by Sweet Jojo Designs - 60in. x 80in.